Rabies is a zoonotic disease, which affects animals and transmits them to humans through a bite or scratch. Schematically, rabies results in encephalitis, an infection of the brain, that is to say the brain. 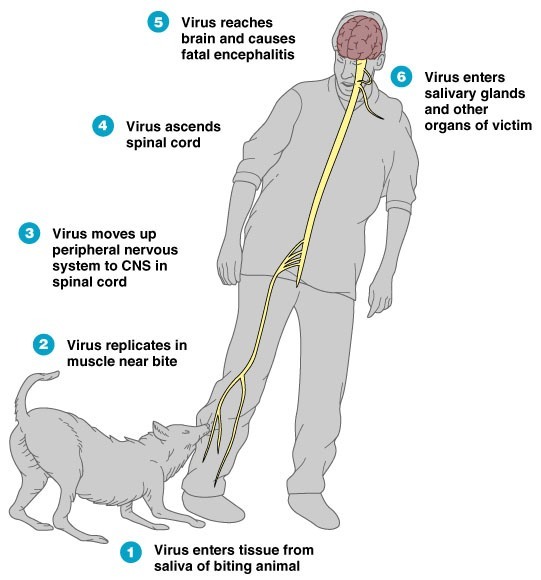 Rabies is a virosis, pathology linked to the contamination of the body by a virus, the lyssavirus, an RNA virus that belongs to the large family of rhabdoviruses (RNA is a simplified version of DNA). This virus is said to be neurotropic because it attacks the nervous system. These viruses are present on all continents, endemic in Asia and Africa (quite widespread), and sporadic in Europe (outbreak of contamination in Eastern Europe, countries of the former Yugoslavia) and in America (some rare cases). In France, 16 departments located in the East are particularly exposed to the virus and see the animal contamination increase regularly: Aisne, Ardennes, Aube, Bas-Rhin, Doubs, Gard, Marne, Haute-Marne, Haut-Rhin, Haute-Saone, Meurthe-et-Moselle, Meuse, Moselle, North, Vosges, and Territoire de Belfort. In Canada, the most recent cases of rabies date back to 2000 in Quebec. The majority of these cases of human rabies were associated with rabies viruses found in bats, but also foxes or raccoons. 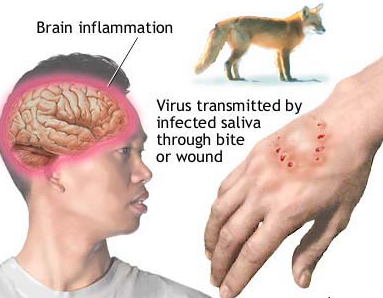 This virus is transmitted to humans essentially by an animal bite or scratch from an infected animal that will transmit it via saliva. The animal is the natural reservoir of the rabies virus. As for rodents, they cannot host the virus. Except in exceptional cases (only one world case of spontaneous healing in 2004), once the first symptoms are declared, rabies is always fatal in humans. 17 million people are vaccinated worldwide. Rabies kills about 59,000 people each year, most often by rabid dog bite. Children under the age of 15 are the most exposed because of their proximity to pets. In the domestic animal, the human contamination is possible in the 5 to 7 days preceding the appearance of the first clinical signs and this until their death. The animal is therefore a contaminant before the first signs appear. In humans, incubation can range from 1 week to 1 year with an average of around 40 days. In animals, the diagnosis is made by taking the brain of the bitter animal and its salivary glands, which are analyzed for rabies antigen. Another way to highlight the presence of the virus, the inoculation of white mice. Depending on the technique used, several hours or days (up to one month for inoculation of white mice) are necessary to make the diagnosis. There has been no human contamination contracted on French soil since 1924. On the other hand, there are a few cases of imported rabies contracted abroad among persons who have stayed in Mexico, in Black Africa or in the North, in India. In North America (USA, Canada), rabies is still present. In animals, the symptoms depend on the species concerned. In the dog, for example, rabies results in generalized ataxia (disordered movements), marked hypersalivation, sometimes convulsions of the facial muscles (masseters ), aggressiveness (the dog tries to bite everything that passes by). Finally, the barking is unusual and says “two-tone” (bitonal). Prodromic phase, where the signs are still discreet. It is manifested by itching (pruritus) and tingling (paresthesia) around the bite area as well as small behavioral disturbances (apprehension). The natural evolution of rabies is towards coma inexorably followed by death. Prophylactic (preventive) treatment of rabies is based on vaccination. It consists of the intramuscular injection of an inactivated vaccine. Post-vaccination complications remain rare. The vaccination consists of three injections separated by several days, and can be carried out by a treating doctor, by a vaccination center doctor or in an anti-rabies center (90 centers in France). An antibody test is needed in the following months to evaluate vaccine efficacy. Subject exposed, bitten or licked by an animal suspected of carrying rabies in endemic areas. If in doubt, vaccination must be carried out before the animal is diagnosed with rabies, dead, wandering and / or lost sight of. Vaccination is effective when rabies remains silent (no symptoms). Vaccination is systematic if it is a bite by a wild animal belonging to the animal reservoir (fox, bat, etc …). Immunization is not routine if it is a bite by a healthy animal that can be observed for 14 days. The first injection must be done within 24 hours after the bite, even if the subject was already vaccinated against rabies. In subjects before exposure , in pure prevention, vaccination is recommended in people living in endemic areas (eastern France in particular) and professionally exposed to the virus: veterinarians, renders, hunters, butchers, taxidermists, game wardens, foresters, speleologists (bats) … Vaccination is also recommended for travelers, especially children, traveling through endemic areas for more than a month and away from rapid access to care (Asia, Black Africa, Africa North, South America …). Information for travelers in endemic areas, particularly in countries where access to inactivated vaccine is difficult. For information, in most developing countries, there is one dog (adopted or not) per 10 inhabitants. On average, about 100 dog bites are reported per 100,000 populations each year in endemic countries. Abroad as in the East of France, avoid contact with stray animals, especially dogs and cats. The local cleansing of the wound which aims to remove the virus by an immediate cleaning of the bite site (soap, detergent, rinsing abundant with water) and the application of antiseptic. In some cases, it is necessary to treat the bite by eliminating the flaps of skins. The application of anti-rabies serum to the skin could reduce the risk. In wild animals. Prevention aims to vaccinate wild animals (mainly foxes) in their environment, in spring and autumn, with a live attenuated vaccine mixed with bait (meatballs). In domestic animals (dog, cat, ferret). Vaccination is done by injection. It is recommended, even mandatory in certain circumstances (travel abroad, gatherings …). Recall that any domestic animal (dog, cat, and ferret) not vaccinated and put in direct contact with an infected animal must be euthanized in principle. As soon as a biting animal is suspected of being contaminated, vaccination should be routine in unvaccinated bitten humans. The treatment involves the injection of immunoglobulins, in other words antibodies. The majority will be injected around the wound and the remainder intramuscularly. Immunoglobulins are not recommended in men who have already been vaccinated before the bite.